Release Date: June 1st, 2007 by Universal Pictures. The Cast: Katherine Heigl, Seth Rogen, Paul Rudd, Leslie Mann, Jay Baruchel, Jonah Hill, Jason Segel, Martin Starr, Alan Tudyk, Kristen Wiig, Harold Ramis. BASIC PREMISE: When Ben (Rogen) accidentally impregnates Allison (Heigl) during a one-night stand, she tries to become romantically involved with him. ENTERTAINMENT VALUE: On the one hand, Knocked Up is a gross-out stoner comedy with Ben and his stoner, slacker friends (Baruchel, Hill and Segel) and, on the other hand, Ben spends time romancing Allison while trying to show some support and maturity during her pregnancy. Then there’s the subplot with Allison’s sister, Debbie (Mann) and her husband, Pete (Rudd), who may or may not be cheating on her. Ben and Allison make for an interesting odd couple, especially given that Ben is a bum and Allison has a promising career at E! Entertainment Television. It’s odd, though, that neither of them ask for each other’s age when they go out on their first date. The premise sounds compelling and leaves room for potential surprises both in drama and comedy, but, more often than not, writer/director Judd Apatow goes for crass, disgusting humor to try to push the envelope, which has already been pushed far enough in There’s Something About Mary, Borat and Apatow’s very own 40 Year Old Virgin. If Apatow had just focused on the comedy and toned down the drama and romance or focus on the romance and drama while toning down the comedy, this wouldn’t feel so uneven. Fortunately, Katherine Heigl and Seth Rogen both work well of each other. Rogen, in particular, gives a charismatic, humorous performance and really sinks into his role here—as a side-note, he actually had a cameo in a classroom scene in Donnie Darko where he looks like a typical jock rather than a bum. 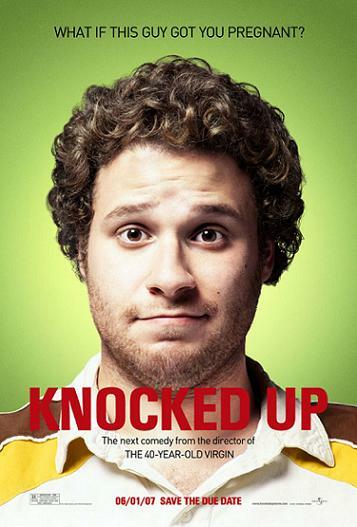 Ultimately, Knocked Up combines humor, drama and romance with awkwardly mixed results. It overstays its welcome at an excessive running time of 2 hours and 9 minutes. SPIRITUAL VALUE: None, other than the importance of taking responsibility and to give people, especially someone you date, chance even though he or she may not seem to be your type. INSULT TO YOUR INTELLIGENCE: Awkward balance of gross-out, stoner humor and serious romance/drama. IN A NUTSHELL: A funny, charismatic cast barely compensates for an awkward mix of serious romance and drama with gross-out, stoner humor.